I ran into a Traditionalist Freemason! Fabio Venzi is an Italian Freemason (Grandmaster of the Gran Loggia Regolare d’Italia at the time of writing) who saw a few books being made available in English. The original title of this 2012 book is Introduzione alla Massoneria so the translators were aware of the Traditionalistic content of the book. Venzi wrote a highly interesting work that is ‘very Traditionalistic’. The author has this authoritarian tone and disdain for ‘lesser’ ways of working that we also find with other Traditionalists. He quotes Guénon and Evola extensively (and hence is not afraid for Evola’s bad name), but he certainly is no slavish follower. Would he have been a slavish follower of Guénon, he probably would not have been a Freemason to start with. He shows himself an independent thinker when he proves not to be afraid of citing an author such as Charles Leadbeater. What makes the book particularly interesting, though, is that Venzi quotes country mates of his, some of whom I never encountered in English before. I am mostly thinking of Arturo Reghini. But also Evola and even Mircea Eliade are quoted from Italian titles that I do not immediately know an English counterpart of. Venzi has a take on Freemasonry that was new to me. He is of the opinion that Freemasonry did not directly evolve from “operative” Masonry; that Freemasonry started a a moralistic organisation that only got esoteric later. That esotericism mostly came from the so-called Cambridge Platonists. As modernity’s destructive course ran on, Freemasonry was effected and fell back to a modernistic and moralistic organisation that has (almost?) lost its initiatic chain. This story, Venzi tells with though-provoking chapters, but also with chapters that come across fairly superfluous to me. 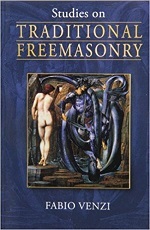 Quite large parts are not (really) about Freemasonry, so I can recommend this book not only to people who are interested in Freemasonry, but also to people who are interested in reading the thoughts of a contemporary Traditionalist. There is enough in this book for book types of reader. Indeed, an unexpected book to run into. Venzi is a little less dreadful about Freemasonry as Guénon or Evola, but even though postponed, Venzi also sees a downfall for Freemasonry. See here for quotes from the book.